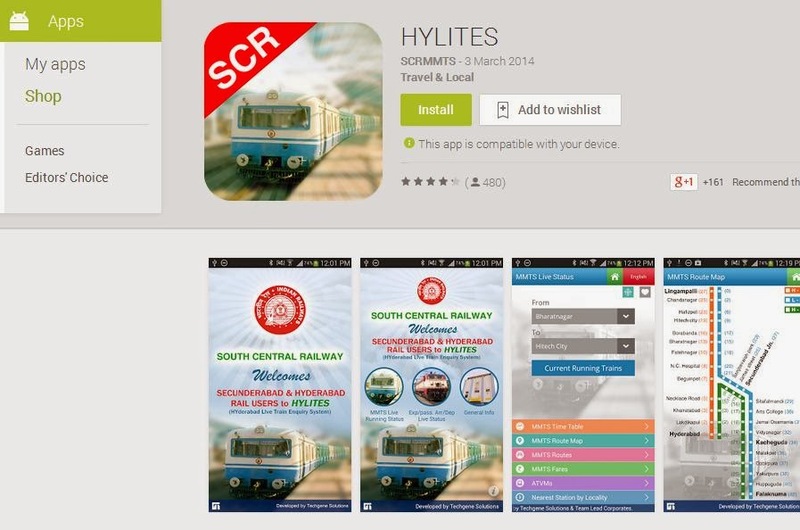 HYLITES (Hyderabad Live Train Enquiry System) is a next generation technology initiative from South Central Railway to provide real – time information on the current status of running of Multi Model Transport System (MMTS) trains over 26 MMTS stations of Hyderabad and Secunderabad for the benefit of rail users. This App also provides the actual arrival/departure timings of express/passenger trains and their nominated platforms at the three major passenger terminals – Secunderabad, Hyderabad and Kacheguda stations. In addition, this app contains useful information required by the rail passengers in general on a host of other subjects. Following are HYLITES Mobile Application details. MMTS Time Table: This allows you to view a detailed time schedule of MMTS Trains by selecting the “From” and “To” stations during a selected duration. MMTS Route Map: Complete route map of the MMTS Train Stations in the twin cities is shown. MMTS routes: You can view the various train routes, trains and distances between the stations in each of the routes. MMTS fares: This section provides you info on MMTS Train fares based on the route selected. It also provides the details about the monthly pass for both the first and second class users. ATVMs: This section provides info on Automatic Ticket Vending Machines (ATVMs). Nearest Station by Locality: This feature allows you to identify the nearest train station by entering the colony name. Live Status of Express/Passenger Trains: This section displays the live status of all the trains currently expected to arrive/depart at/from Secunderabad, Hyderabad and Kacheguda stations. You can view the info in any of the 3 languages – English, Hindi or Telugu. Time Table: This section provides the scheduled arrival and departure timings of express/passenger trains from/to Secunderabad, Hyderabad and Kacheguda stations to/from various important cities in India. Help lines: Provides a list of important phone numbers and one-touch call facility for general enquiries and also to contact the authorities such as Railway Protection Force, Government Railway Police etc. in case of emergencies. Ambulance, Hospitals, Hotels and Cabs: These sections furnish contact numbers and one-touch call facility to access some of the agencies for services like ambulance, hospitals and cabs etc available in Hyderabad.